(Chris Detrick | The Salt Lake Tribune) The red, white and blue sign on Big Ed's, 210 University Street, was stolen Thursday. It's the second mystery surrounding the restaurant that suddenly closed last September. Big Ed’s iconic red, white and blue sign is missing. Peterson hopes the theft — which occurred several months ago but was posted on social media Thursday — was just a prank by one of the nearby fraternities at the University of Utah and that a good Samaritan will return it soon. 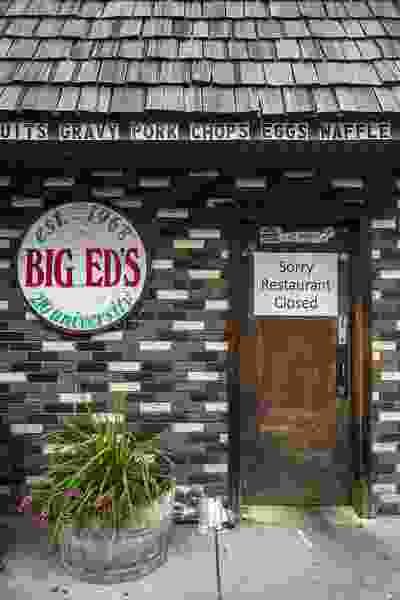 The sign’s disappearance is one more mystery surrounding Big Ed’s — a hole-in-the-wall restaurant beloved by U. students since 1968. One day last September, the mother and son who operated the breakfast, beer and burger joint placed a “Sorry Restaurant Closed” sign on the front door without an explanation. Peterson said he has not heard from the operators since. The building is currently being remodeled to make way for a new coffee shop called Publik Ed’s. It will be the fourth store for Salt Lake City’s Publik Coffee Roasters. Peterson said the new tenant had hoped to showcase the iconic sign when the shop opens in July.